This week, the decision was finally made about where the most powerful telescope has ever been conceived will be built starting in 2015. 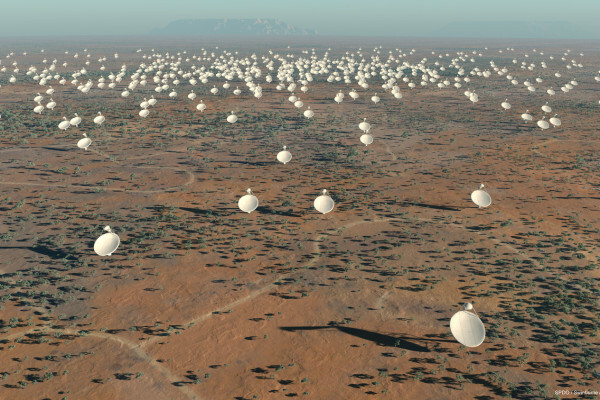 Square Kilometre Array, the SKA, this is a multi-billion pound network of over 3,000 radio dishes that will enable scientists to see further into the universe's history than we've ever seen before. This week though at a meeting in the Netherlands, it was decided that rather than award it to just one, both countries would end up hosting parts of the telescope. Bernie Fanaroff is the Director of the South African bid and he was at that meeting.
' alt='Artist's impression of the 5km diameter central core of SKA antennas.' >Australia and the dishes, and the aperture array would be built in Africa. Chris - And spreading the telescope out not just across two countries but two continents, there's an ocean in the middle, does that in any way alter the way in which the project has to be operated or does actually spreading them out in this way strengthen things? Bernie - In the first stage, it will allow us to do more science for pretty much the same amount of money. In the second phase, we still have to go through a very intensive period of system engineering, and technology down selection and so on before we can make accurate estimates of the cost, but I don't expect the cost of operating the two sites to be restrictive. As far as the science is concerned, what we'll do is analyse the data from each of the three arrays, pretty much at the site themselves. So, what will be transmitted to science centres around the world is already concentrated down by the high performance computing centres. Chris - The fact that this is coming to South Africa, it could not have done, it could've ended in Australia, what does this mean to southern Africa? Bernie - Well, I think first of all it's a recognition that southern Africa can do it. I don't think that a lot of people would've seen South Africa and Africa as a possible centre for high tech and leading mega science. So, it's really a way of changing the world's perception of what we can do and also of course, it changes our own perception of what we can do. We've already seen that a lot of enthusiasm over the meerkat, lots of young people coming into science and engineering, over 400 growing since 2005, young people from all over Africa, and we've seen a lot of very, very good young researchers coming from Europe and North America, and other places to work in South Africa. So, we expect that'll increase. Hopefully, what we'll be able to do is to reverse the brain drain. Is a hydrogen-based infrastructure expensive?